OK, OK, so if they look familiar, these are actual tweets. Just not from Donald Trump. They are from Rick Schwartz, aka the Domain King. Schwartz has recently come out of public-comment retirement to dish on domain names. 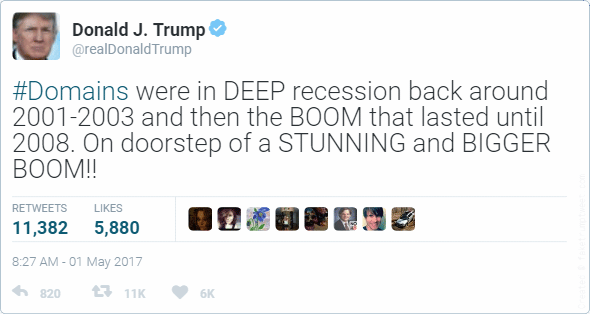 Do you think he learned a thing or two from Trump’s style on twitter? 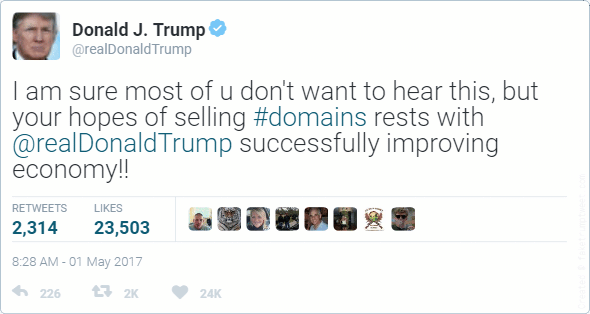 Maybe President Trump should buy http://www.DailyTrump.com from our portfolio. Arguably more depends on Xi Jinping. Rick drank the Trump Kool Aid which means he’s a dumbass. Trump will kickoff the Domain Name revolution after we deal with the Established Communist Globalist Puppets that lurk in the DC SWAMP!